Stock up on this fabulous set of coils for the Valyrian Tank by Uwell! Hiqh quality and powerful, these coils are absolute perfection! With a 0.15ohm rating, these quad, parallel legged coils are able to offer superior cloud production and flavor experiences that will blow the user away! 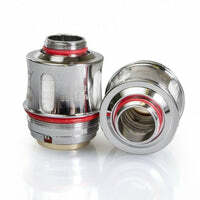 2 x Coil replacements for the Valyrian Tank by Uwell. Uwell Valyrian 0.15 Ohm Replacement Coils (2 Pack) - Uwell has a rating of 4.9 stars based on 30 reviews.